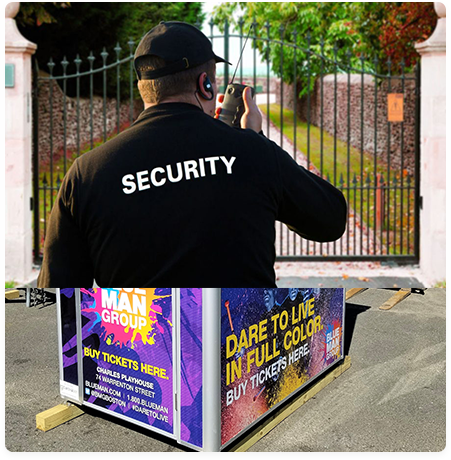 Security guard shacks, ticket booths, and valet parking booths manufactured by Guardian Booth are about as dependable and maintenance free as you’ll find. They’re built and designed to last at least 15 to 20 years and, under normal circumstances, rarely need more than the basic maintenance you would perform for your home or place of business. Air Conditioner filters should be cleaned or replaced on a regular schedule and should be checked every month or two – especially during the summer. The evaporator coil in A/C units absorb heat as air passes over the coil. The air filter is what protects the evaporator by trapping dust and pollen. When the filter gets dirty, the unit must work harder to cool things down because the air reaching the evaporator is diminished. You’ll want to run the air before it gets too hot to make sure everything works. It’s also a good idea to run a hand vacuum over the air intake fins and coils at least once a year. Baseboard heaters should be cleaned periodically to prevent dust and debris from getting into the heating elements. While dust won’t usually harm the unit, you may notice an unpleasant burning smell when you start it up in the fall. We recommend vacuuming the unit at the beginning and end of each heating season. Again, you’ll want to fire it up before it gets too cold to make sure everything is in working order before you really need it. 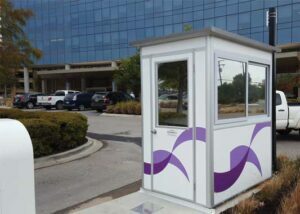 When your booth sits outside for extended periods of time, such as in a parking lot or at a work site, it will be exposed to all sorts of weather. You’ll want to check some things periodically. Window drain holes should be checked and cleared of any debris to prevent water buildup or mold from forming. Guardian Booth’s structures are built solid with two layers of durable galvanized steel panels and then filled with weather-resistant insulation for comfort. If you feel a draft or heat leakage around windows or doors, first make sure they are tightly closed. If you still feel a draft, you may need to replace the weather stripping. Normal wear and tear can cause the weather stripping around doors and windows to crack or break, as will extended exposure to the elements. Replacing the weather stripping is a relatively easy and inexpensive process. Remove the old weather stripping and make sure the surface is clean and free of residue. You can replace weather stripping with a variety of products, including adhesive-backed foam tape, peel-and-stick V-shaped vinyl, or tubular rubber gaskets. These materials can be found readily – and cheaply – at your local hardware store. Time and exposure to the elements, including the sun and climate changes, can cause electrical wiring to experience dry rot or corrosion. Wiring can also get damaged by accident, such as banging into a wall with a chair or dropping something against the cover of an outlet. Periodically check the wiring casing. In the rare event you see fraying, cracking, or splitting, you may need to replace the outer casing or the line itself. The flooring in a Guardian Booth is made of a strong galvanized steel diamond plate designed for commercial use. It is an incredibly strong and reliable surface that is designed for long life. There may, however, be wear and tear on the surface because of foot traffic in the booth or exposure to moisture. “At some point in the future the floor may require attention,” said Aron Gold, Production Manager at Guardian Booth. If maintenance become necessary a couple years down the road, Gold recommends grinding off any surface material. “Then, prime the area with a rust prevention paint, and paint a final covering with a durable product like Rhino Liner ™ or Tuff Coat ™, which can be rolled on or sprayed,” he said. You are more likely to need an updated logo or signage on your Guardian Booth than to need a makeover on the booth itself. 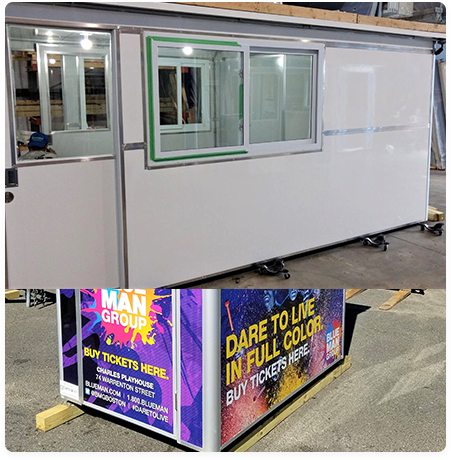 Booths are made of steel and aluminum for durability, and painted or finished with a vinyl protective wrap of metal, gloss, satin, or carbon fiber finish. They are rust free and rot proof. Nevertheless, at some point in the future, typically after 8 to 10 years, you may want to put a fresh coat of paint on the outside to refresh the exterior appearance and make it look new again. In the rare event there is a problem with your Guardian Booth, every booth includes a free one-year warranty on structural damage resulting from defects in the materials. The warranty does exclude cosmetic defects, such as dents and scratches after installation, damage resulting from negligence, natural disaster, or post-installation modifications. Guardian Booth has had very few warranty claims. The most likely scenario would be damage to the booth in the shipping process. To prevent this, booths are packed and shipped inside a heavy-duty wooden crate to prevent accidental damage. Guardian Booth also offers assistance with on-site repairs for damage outside the warranty at a minimal cost. “Another time,” Taub said, “a helicopter in Maryland landed too close to one of our booths on the grounds of a high school and clipped one of the windows.” The rest of the booth was undamaged, so Guardian Booth shipped out a new replacement window for a minimal cost. Your Guardian Booth is built with rugged materials to withstand wear and tear, time, and severe weather. With a minimum amount of attention, it will have a long life. 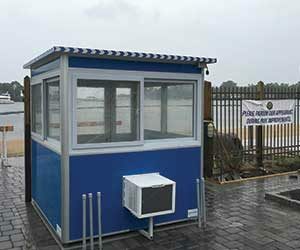 Guardian Booth is a manufacturer of prefabricated structures, security equipment, security supplies, enclosures, and booths for guards, parking attendants, ticket vendors, and cashiers. 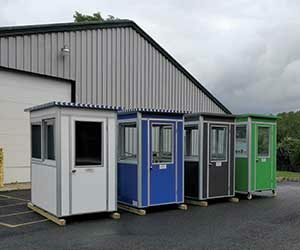 In addition, Guardian Booth is a market leader in portable security booths and modular office enclosures. For pricing information, visit our pricing page or contact us directly. With a focus on security, efficacy, and professional appearance, our research team has designed the highest quality booths available. Thank you for reaching out to us. We will get back to you soon. Thank You for submitting your quote.We will contact you to finalize your options and send you your finalized quote.